Re: Firewood on a boat? 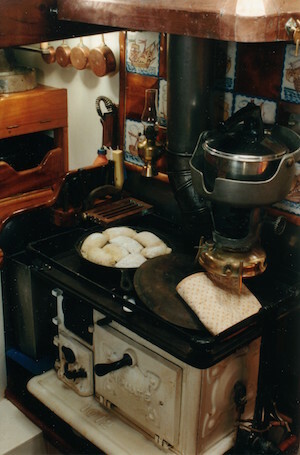 That is a most impressive galley stove! I can smell the bread baking now. I have a Sardine on my 32 foot Tahitiana which has been a godsend while sailing in Labrador. The stove keeps the boat dry and cheery even on dreary foggy days. Three sizes of wood used - very small, no larger than finger sticks to light the fire, " middlings" and larger pieces, in fact 2x4 5" which the tiny stove thinks are logs. One large sack lasts about a month. Yes there is some dust and mess but the cheeriness is worth that and the work. Drift wood can be used IF the wood is gathered where the winter storms had pushed driftwood and where rain has washed off the salt. Gathering wood is a pleasure excuse to go ashore, walk on a new beach. And many times the generous people of Labrador and Newfoundland brought birch or other hard woods to the boat as gifts. I have a Simpson Lawrence fireplace onboard Siren Song, my 1966 Ted Hood. I primarily use charcoal briquettes because of convenience, compact storage and they generate nice heat, which is essential to have good convection to keep the smoke out of the cabin. I will occasionally burn wood, usually drift wood if I am running low on charcoal...burns hot, but really fast. Have also tried a few other fuels...lump charcoal (lots of popping) and pressed wood (very smokey). I would certainly use some nice dense hardwood chunks if it presented itself. It throws off a ton of heat, once started very little smoke and makes my boat a very popular spot on a cool fall evening. One nice bonus to my setup is that the fire place backs up onto the head and turns it into a great wet locker to dry things out...and keeps the seat warm. GafferMate...that is a spectacular stove!!! See "Bradley Burner" as a way to burn wood pellets in a solid fuel stove. DIY to fit your stove. Pellets in a heap just smoulder and smoke, need good airflow under/through to get good burning. You'll need a propane torch or fire gel to get it going. Pellets come in 40lb heavy plastic bags for $5, easy to handle and keeps the mess down. Beware, they turn into oatmeal if wet even slightly!! Another option is compressed saw dust logs, popular because they don't contain creepy crawlys and store well. They can be pre cut to stove size and easily stored. They produce almost no ash too- which is kind of cool. You have to watch these, a lot of them expand dramatically with heat, and can overflow from the firebox. It took me a while to find something really effective to prevent that (without also destroying the burning properties), for a friend with a factory making them. Something that's a bit off, there's so called 'Green' businesses selling a 'wood' briquette which isn't wood. It's actually brown coal, and they charge a fortune for them. That is a very nice stove..Was wondering about the name of your boat "PILAR" interesting..?